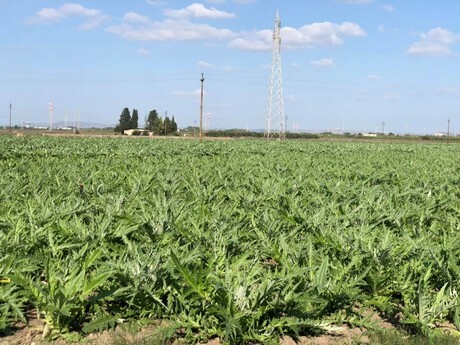 Artichoke harvesting started around twenty days ago in Sardinia and the same should also be true for Puglia and Sicily. However, volumes are not high due to a previous period characterized by heavy rain, frost, hailstorms and floods. Quality is also not excellent, but it will soon improve. "Producers and cooperatives have reported they are at a quarter or a fifth of what they had harvested last year in this same period. The produce was almost entirely lacking until one and a half months ago and, whatever there was, was sold on the local or domestic markets at significant prices," explains agronomist Orazio Casalino. "Operators are dissatisfied with the quantities harvested. Prices are high due to the lack of produce, not due to the high quality. In addition, there is a lot of foreign produce available on the domestic market." Larger volumes are expected for the next two weeks. "There is a high pressure front with temperatures reaching 21°C. We are just hoping in a bit of rain." Casalino confirms that quality is increasing in Egypt, also considering that many Italians are transferring their know how. "They are good producers and have evolved from a phytosanitary level. In addition, we must say they comply with our specifications because they know the produce will be analysed and sent back if non-compliant. Their quality is improving." "The origin of the produce must be clearly stated - a foreign product should not be passed off as Italian, as it must be consumers to choose if they want to buy an Italian or Egyptian product and at what price. Both large and small distributors should state the origin clearly."